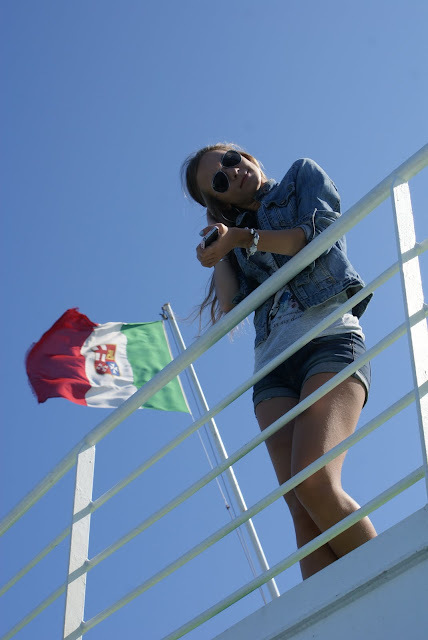 The day on board of Grimaldi Lines. I woke up at 9 am. The cabin was without the window so the feeling was like it was still night. I left the cabin and saw some people sleeping on the floor and on the sofa near the reastaurant. I was a little shocked =). Then I realized that these were the people who had a cheaper ticket - they didn't pay for the cabin. Wearing Zara jacket, Stradivarius T-shirt, Mango shorts, Claire's necklace, Stena Line bracelet, Ray-Ban sunnies. We always stay in our country if we go on holiday but we'll maybe go to Italy next year, I hope so. It looks amazing there, it's raining here. We hope that you'll take a look to our blog too! this looks beautiful!! i'm jealous! !